"I have been looking for a long time for a protein bar, or at least something close, that didn't taste either flat or just plain-old bad. I tweaked this one to get around my tree-nut allergies and finally have the recipe I'd been seeking! These are yummy, and my teenage daughter even likes them! Store refrigerated." 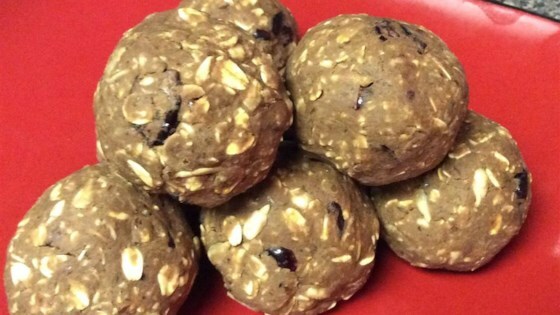 Mix oats, chocolate chips, sunflower seed kernels, cranberries, protein powder, peanut butter, flax seed, and honey together in a large bowl using your hands to assure ingredients are well integrated. Stir milk into the oats mixture with a spoon until the mixture is even in texture; divide and shape mixture into 10 balls. Any type of chopped nuts can be substituted for the sunflower seeds. Try whatever nut butter you prefer for the peanut butter. Almond or soy milk can be used in place of the skim milk. Wow these are fantastic and taste better than protein bars. I used m&ms since I had no chocolate chips on hand. Thanks for sharing! Great option to get a boost of protein if you are tired of protein shakes. Used chocolate powder in place of the vanilla to boost the chocolate factor. used walnuts instead of chocolate chips, almond milk, and almond butter instead of peanut butter. Super easy and fast to make and tastes great.